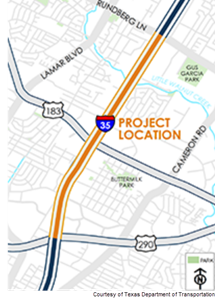 Both I-35 and US 183 area serve as primary corridors through Austin but the Texas Department of Transportation​ says connectivity and mobility are lacking at the interchange. TxDOT plans to build flyovers from I-35 southbound to US 183 southbound, US 183 northbound to I-35 northbound and I-35 southbound to US 183 northbound. The flyovers are needed but there is a chance the additions could bring even more traffic.